The button is used for downloading a document. Simply click the button and follow any prompts that appear. The button is used to delete a document. Clicking this button will not only remove the document from the Documents tab, it will also remove it from its original location within Broker Brain. 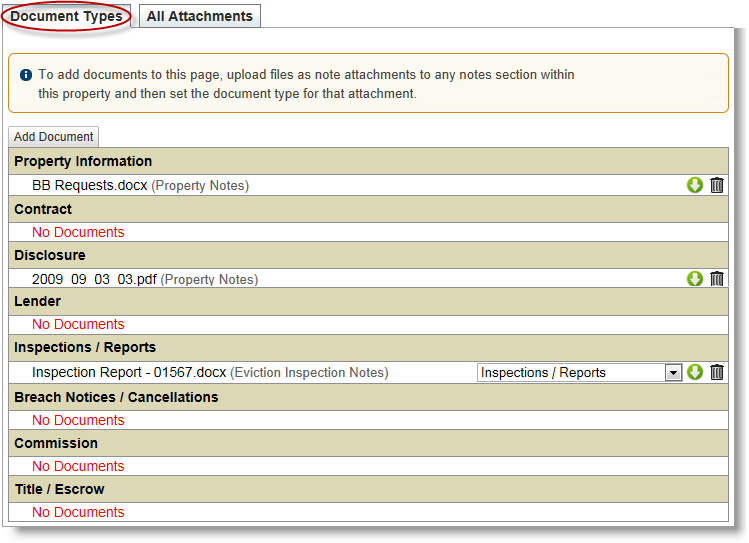 The All Attachments sub tab (shown circled below) contains a comprehensive list of all documents added to a property, grouped by the tab on which they were added. You may notice groups that appear to have similar names, such as "Eviction", "Eviction Inspection" and "Eviction Inspections". These are different places within Broker Brain on which you can add notes, all housed beneath the same sub tab (in this example, they are all housed beneath the Evictions tab). Some documents will have gray text in parentheses next to the document name. This text indicates that the document has been assigned a "type" and will also appear on the Document Types sub tab of the Documents tab (read the Viewing Documents by Type section below for more information). You may find it useful to search for a property's documents based on how recently they were added into Broker Brain. For more information, click here and review the information on Searching All Property Notes. The Document Types sub tab (shown circled below) displays documents that have been assigned a Type. When documents are added into Broker Brain, you can assign them a type, indicating what type of information they are related to. For example, in the screen shot below, the Disclosure section contains one document. This is because the document that resides there was typed as a Disclosure document, therefore, it will display in that section. 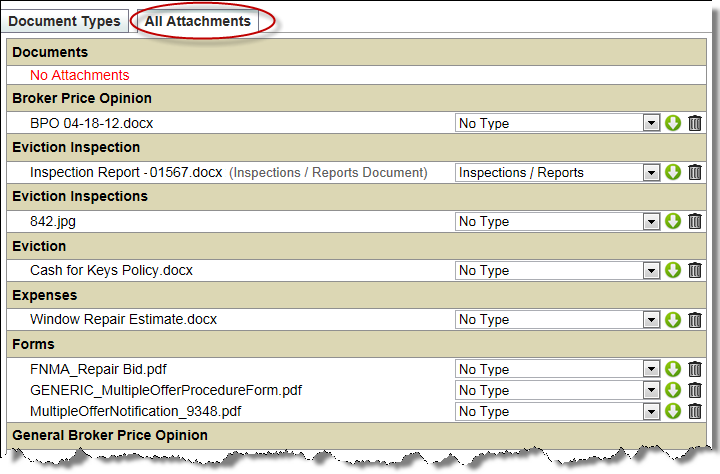 For information on adding documents and assigning document types, see Attachments. For information on adding additional document types, see Document Types. The documents listed here will have gray text in parentheses next to the document name. This text indicates in which section the document is stored within Broker Brain.